Each and every time you connect your iPhone to iTunes, it will perform backup action (unless you disable it using Backoff) that will store the data in your mobile phone into your local folders. These data includes calendar events, images, videos, notes, messages and many more. However, these data are not users friendly and if you are looking for specific tool that can recover it, iPhone Backup Extractor is one of the great utilities that can you can rely on. Surprisingly, there are six separate backup folders that appeared on the screen when I run this utility. And users can select on any of them to retrieve. When selecting the specific backup folder, it will also list down all the backup details such as the device, either iPhone 3GS, iPad or 3G, time of backup being done, Serial, IMEI number, Firmware version which could be useful in order to identify which specific device especially when you have too many of them being synchronized to same PC. Once selected, it will show the available data ready for restoration. By default, it will be shown in ‘Simple’ mode and in case you are looking for slightly more low level tree view, switch it to Extract mode by clicking on ‘Extract selected’ button. This is quite useful when you have lost your physical mobile phones and would like to retrieve them back from your local PC. However, there are some limitation being posted that will allow users to restore up to 2 files at any time and with a short extra delay if users choose to use the free version without registration. To remove such restriction, users can get the registered version at $24.95 with email support and 12 months upgrade. 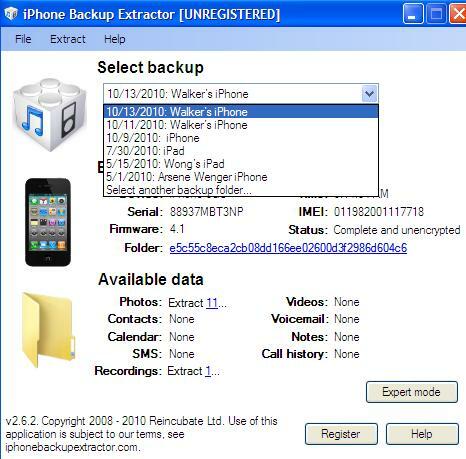 The iPhone Backup Extractor will run on any Windows XP, Vista or Windows 7 PC, in both 32 or 64-bit mode and even on Linux and Mac OS environments. Alternatively, users can also try Wondershare iToolkit as another option.